If you need to measure loads from up to four mini load cells simultaneously, such as to build a multi-sensor scale, then take a look at our four channel DQ-4000U interface with USB or wireless output. If you also need a LCD display with your load cell, then the four channel DS-4000U LCD Display is an excellent add on to the mini load cell solution. 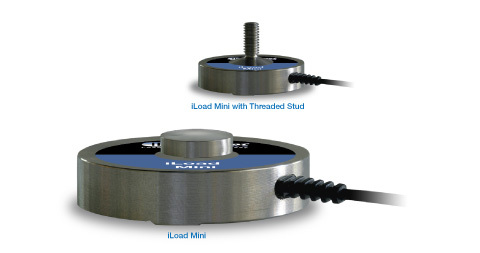 Loadstar Sensors iLoad Mini load cell is based on the same Capacitive Technology as the iLoad and iLoad Pro load cells. However, it differs in one important respect - the Mini outputs a square wave whose frequency is proportional to the applied load. The Mini, the smallest load cell currently offered by Loadstar Sensors, is a small circular sensor with a diameter of just 1.25 in. 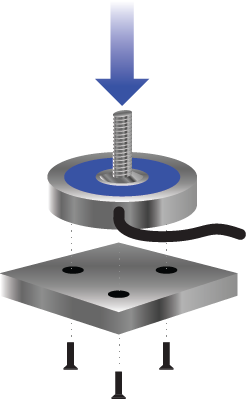 and is available with either a threaded stud or a load button on top of the load cell. It has three threaded holes on the bottom of the sensor to easily mount the load cell with commonly available hardware. If your application needs an analog (0-5V or 2mV/V) or digital USB output from the iLoad Mini the DQ-1000A or DQ-1000U capacitive load cell interfaces are available as options. or data acquisition system. Available interface for USB or analog output. Threaded mounting holes for easy attachment using standard fixtures. Compression calibration included. Call for tension or universal calibration options. Unlike conventional resistive sensors based on either strain gauges or piezo-resistive techniques, Loadstarâ€™s breakthrough patented technology harnesses changes in capacitance to measure loads quickly and accurately. In the Mini, the change in capacitance is converted into a change in frequency of the output signal. The load cell accepts a 5V DC input and outputs a TTL square wave whose frequency is proportional to the applied load. Most data acquisition systems, microprocessors and microcontrollers have the capability to measure the frequency of the signal. The iLoad Mini load cell has 2 frequency outputs. When Control Input = logic ''1'', the Mini outputs the sensor frequency, Fsensor. When Control Input = logic ''0'', the Mini outputs the reference frequency, Fref. The compensated frequency Fcomp = Fsensor - K*Fref, where K is a constant provided by Loadstar. Loadstar provides the coefficients for the quadratic equation to translate Fcomp to load. If you use this miniature load cell with the DQ-1000 or DQ-4000 or DS-4000 frequency to USB interfaces, then you can obtain calibrated load or force data in N, lb, or kg. Once you've picked a load cell and max capacity, please select an interface device if needed. We offer digital interfaces with Serial TTL/USB Output. Once you've picked a load cell and max capacity, please select a wireless interface device if required for your application. Please note that the throughtput for wireless output generally is lower than that for wired outputs. Once you've picked a load cell and max capacity, please select an interface device if needed. Digital USB load cells or resistive load cells with digital interfaces can be operated on a PC via our LoadVUE software. The software can be used with single load cells or multiple load cells and some can be used to control external devices via USB relays. After you've picked a load cell and interface device if needed, please select a calibration option from those shown below. It could be digital calibration or analog (0.5 to 4.5 VDC) calibration. And the mode can be compression only, tension only or universal. Max data rate is about 150 Hz by default for our Capacitive load cells with USB output. To get data rates as high as 500 readings/sec, please add the high speed option to your order. Add one more of these accessories for convenient operation. Some accessories are only used with specific load cells. Add these universal adapters if you want apply a tensile load. 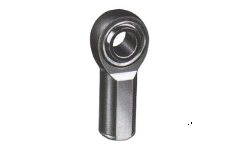 Add these rod ends if you want apply a tensile load. You will need 2 for each load cell. Add these eye bolts if you want apply a tensile load. You will need 2 for each load cell. You will also need a universal adapter for each load cell. 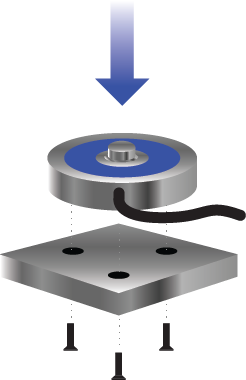 Add these load buttons for easy application of a compressive load. Normal lead time for shipping orders is approx. one week after receipt of order via Fedex 3 Day service for US orders. If you want expedited processing of your order, please select one of the options below. Note: Fee is per item.